Symphysiotomy is a surgical procedure in which the cartilage of the pubic symphysis is divided to widen the pelvis allowing childbirth when there is a mechanical problem. It is also known as pelviotomy, synchondrotomy. Symphysiotomy was advocated in 1597 by Severin Pineau after his description of a diastasis of the pubis on a hanged pregnant woman. Thus symphysiotomies became a routine surgical procedure for women experiencing an obstructed labour. They became less frequent in the late 20th century after the risk of maternal death from caesarean section decreased (due to improvement in techniques, hygiene, and clinical practice). The most common indications are a trapped head of a breech baby, shoulder dystocia which does not resolve with routine manoeuvres, and obstructed labor at full cervical dilation when there is no option of a caesarean section. 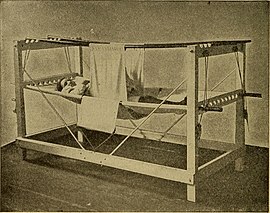 In some Irish cases, caesarean sections were performed after symphysiotomies. Currently the procedure is rarely performed in developed countries, but is still performed in "rural areas and resource-poor settings of developing countries" where caesarian sections are not available, or where obstetricians may not be available to deliver subsequent pregnancies. Symphysiotomy results in a temporary increase in pelvic diameter (up to 2 cm) by surgically dividing the ligaments of the symphysis under local anaesthesia. This procedure should be carried out only in combination with vacuum extraction. Symphysiotomy in combination with vacuum extraction can be a life-saving procedure in areas of the world where caesarean section is not feasible or immediately available. Since this procedure does not scar the uterus, the concern of future uterine rupture that exists with cesarean section is not a factor. The procedure carries the risks of urethral and bladder injury, fistulas, infection, pain, and long-term walking difficulty. Symphysiotomy should, therefore, be carried out only when there is no safe alternative. It is advised that this procedure should not be repeated due to the risk of gait problems and continual pain. Abduction of the thighs more than 45 degrees from the midline may cause tearing of the urethra and bladder. Apply elastic strapping across the front of the pelvis from one iliac crest to the other to stabilize the symphysis and reduce pain. Leave the catheter in the bladder for a minimum of 5 days, or at least three days after the urine has cleared following hematuria, or six weeks in the case of a fistula. Encourage the woman to drink plenty of fluids to ensure a good urinary output. Encourage bed rest for 7 days after discharge from hospital. Encourage the woman to begin to walk with assistance when she is ready to do so. If long-term walking difficulties and pain are reported (occur in 2% of cases), treat with physical therapy. It is estimated that 1,500 women unknowingly and without consent underwent symphysiotomies during childbirth in the Republic of Ireland between 1944 and 1987  A 2012 study found that many of the victims say the Catholic Church "encouraged, if not insisted upon, symphysiotomies." It has been suggested that during that period, non-Catholic doctors recommended sterilisation of women after three Caesarean section operations, while Catholic doctors usually recommended "compassionate hysterectomies" as a solution to the prohibition on sterilisations. Despite legal restrictions being placed on the use of artificial contraceptives, the average size of families in Ireland declined from the 1930s. Dr. Alex Spain was master of the National Maternity Hospital during the mid-20th century, and performed 43 symphysiotomies during his tenure. Spain's successor, Arthur Barry, was also a strong supporter of Catholicism and the practice of symphysiotomy. In 2002, Survivor Matilda Behan and her daughter, Bernadette, set up an advocacy group for the victims called Survivors of Symphysiotomy (SoS). Matilda was operated upon at NMH 17 days before her baby was born. She thought she was being brought to theatre for a Caesarean section. No one told her the plan was to do the 'new procedure,' a pubiotomy. In 2008, the Irish Human Rights Commission recommended that the Government should reconsider its decision not to set up an independent inquiry into symphysiotomy. The Minister for Health refused. On 18 February 2010, an RTÉ Prime Time documentary revealed that, over half a century, some 1,500 women had symphysiotomies performed on them in childbirth by doctors to ensure childbearing without limitation, train medical personnel and perfect the surgery for Africa. Following the programme, victims of the procedure called on the Minister for Health, Mary Harney, to initiate an independent inquiry. Instead, she commissioned the IOG, a training body, to inquire into itself by reviewing operations carried out by some of its own members for teaching purposes. A Dáil debate on the issue was heard on 15 March 2012, which was organised by Deputy Caoimhghín Ó Caoláin. Leading the debate in the Dáil, Ó Caoláin compared symphysiotomy to clerical abuse: "The infliction of symphysiotomy on women in Ireland is one of the greatest medical scandals not only here but on an international scale. Symphysiotomy is a clinical scandal on a par with the clerical scandals we have seen exposed in the past two decades." Gerry Adams described the procedure as "institutional abuse involving acts of butchery against women." While Clare Daly declared that "it is an important acknowledgment by the State of the crimes committed against many of the women present today, crimes which led to the suffering endured by them and their families for decades". Eight days later, on 23 March 2012, a County Louth woman, Olivia Kearney, who was subjected to a post Caesarean-section symphysiotomy, which was performed by Dr. Gerard Connolly, was awarded €450,000 by the High Court. The Kearney case was appealed to the Irish Supreme Court, which found in favour of Ms. Kearney and declared that symphysiotomy was not a generally approved obstetric practice in 1969. While the Supreme Court reduced the award of damages from €450,000 to €325,000, the decision represented the first court condemnation of the practice of symphysiotomy by an institution of the Irish state. In June 2012 details of Professor Oonagh Walsh's draft report on the use of this procedure in Ireland were released. The report by Prof. Walsh (UCC) found that although symphysiostomies were phased out in most medical institutions across the country, Our Lady of Lourdes Hospital was practising the procedure until the 1980s a fact linked to the "unswervingly Catholic ethos" of the hospital. The draft Walsh report nevertheless found that symphysiotomy was justifiable and sought to consult with survivors on its findings. The draft Walsh report was criticised by victims' advocate group Survivors of Symphysiotomy, and by a number of opposition TDs and journalists, for failing to adequately address issues such as patient consent, and for perceivably justifying the performance of the operation. Survivors of Symphysiotomy members subsequently decided to boycott the second stage of the Walsh report. Also in June 2012, Survivors of Symphysiotomy testified publicly before the Joint Oireachtas (Select) Committee on Justice. Catherine McKeever, a private patient at the Lourdes Hospital, Drogheda in 1969, told the Committee that she did not realise what had happened: 'I saw him [the doctor] with an instrument which I thought was a bit brace because my father was a wood turner. I felt a crack ... Nobody answered me or said anything'. Margaret Conlan, who was operated upon in 1962 in St Finbarr's Hospital, Cork, testified that she had never been told anything about it: 'My baby's head was perforated and the baby died... I did not find out [about the symphysiotomy] until I read it in the newspaper'. Ó Caoláin introduced the Statute of Limitations (Amendment) Bill, which was unanimously supported by Dáil on 17 April 2013. The proposed legislation sought to lift the statute of limitations for a period of one year, to enable all survivors of symphysiotomy to bring their cases through the Irish courts. By July 2013, the Bill had stalled before the Joint Oireachtas (Select) Committee on Justice, leading SoS to protest outside the Parliament on 26 June. In November 2013, Minister for Health James Reilly announced that Judge Yvonne Murphy had been appointed to review the findings of the Walsh report, to meet with survivors of symphysiotomy, hospital authorities, and insurers with a view to deciding on whether an ex gratia redress scheme would be preferred to allowing legal actions to proceed. The terms of reference for the Murphy inquiry were criticised by Caoimhghín Ó Caoláin, who stated that the "type of scheme outlined in the terms of reference offers the women no prospect of adequate compensation for what was so barbarically done to them nor the choice to pursue their rights in the courts". It also emerged that the Government would no longer support the statute of limitations bill, which had been unanimously adopted by the Dáil in April 2013. SoS rejected the Government's statement and described their plans as 'paternalistic'. In January 2014, an article published in the Journal of Bone and Joint Surgery entitled "Radiographic Findings After Symphysiotomy" found that "late-onset sacroliac joint osteoarthritis was a major finding, secondary to pelvis instability". The study was based on a mean time follow up some forty years of twenty five Irish women who had undergone symphysiotomy compared with twenty-five age-matched and parity matched controls. In March 2014, Survivors of Symphysiotomy made a complaint to the United Nations Committee Against Torture about the Irish State's failure to properly, thoroughly or impartially investigate the practice of symphysiotomy in Ireland. In July, the United Nations committee on human rights called for the Irish government to hold investigation into the issue. ^ a b "symphysiotomy". The American Heritage Stedman's Medical Dictionary. Retrieved March 22, 2012 – via Dictionary.com. ^ Bergström, S.; Lublin, H.; Molin, A. (1994). "Value of symphysiotomy in obstructed labour management and follow-up of 31 cases". Gynecologic and Obstetric Investigation. 38 (1): 31–35. doi:10.1159/000292441. ISSN 0378-7346. PMID 7959323. ^ Morgan, Kellie (30 Jan 2015). "'He was sawing me in half:' Ireland's gruesome era of symphysiotomy". CNN. ^ Monjok, Emmanuel; Okokon, Ita B.; Opiah, Margaret M.; Ingwu, Justin A.; Ekabua, John E.; Essien, Ekere J. (September 2012). "Obstructed labour in resource-poor settings: the need for revival of symphysiotomy in Nigeria". African Journal of Reproductive Health. 16 (3): 94–101. ISSN 1118-4841. PMID 23437503. ^ Verkuyl, Douwe Arie Anne (2007-03-27). "Think globally act locally: the case for symphysiotomy". PLoS Medicine. 4 (3): e71. doi:10.1371/journal.pmed.0040071. ISSN 1549-1676. PMC 1831724. PMID 17388656. ^ van Roosmalen, Jos (July 1990). "Safe motherhood: cesarean section or symphysiotomy?". American Journal of Obstetrics and Gynecology. 163 (1 Pt 1): 1–4. doi:10.1016/S0002-9378(11)90653-X. ISSN 0002-9378. PMID 2375330. ^ Onsrud, Mathias; Sjøveian, Solbjørg; Mukwege, Denis (2008). "Complete destruction of urethra and bladder neck following symphysiotomy and results of attempted corrective surgery". Acta Obstetricia et Gynecologica Scandinavica. 87 (5): 574–576. doi:10.1080/00016340802014748. ISSN 1600-0412. PMID 18446542. ^ Armon, P. J.; Philip, M. (July 1978). "Symphysiotomy and subsequent pregnancy in the Kilimanjaro region of Tanzania". East African Medical Journal. 55 (7): 306–313. ISSN 0012-835X. PMID 699843. ^ Maharaj, D.; Moodley, J. (February 2002). "Symphysiotomy and fetal destructive operations" (PDF). Best Practice & Research. Clinical Obstetrics & Gynaecology. 16 (1): 117–131. doi:10.1053/beog.2001.0259. ISSN 1521-6934. PMID 11866501 – via ResearchGate. ^ "Draft Report on Symphysiotomy in Ireland 1944 - 1987, Dr Oonagh Walsh"
^ Jillson, Irene A. "SYMPHYSIOTOMY IN IRELAND: A QUALITATIVE STUDY" (PDF). School of Nursing & Health Studies. ^ "The Lourdes Hospital Inquiry" (PDF). January 2006. p. 236. ^ "'The murder of infants'? Symphysiotomy in Ireland, 1944–66". HistoryIreland.com. Oct 2012. In Ireland at that time so-called ‘artificial’ contraception was illegal, and sterilisation was unobtainable. ^ O'Carrol, Sinead (24 Nov 2012). "A history of symphysiotomy: the impact of Catholic ethics on Irish medicine". The Journal.ie. Symphysiotomy was thought to permanently enlarge the pelvis, and therefore, when carried out in a first pregnancy, it might remove the necessity for a woman with ‘disproportion’ to face repeated CS in future pregnancies. This was a particular problem for Catholic doctors. Contraception was practised in most developed countries, making repeat problem pregnancies less common, and non-Catholic doctors advised sterilisation after three CS. Irish Catholic doctors were unwilling to do this. They were aware of criticism by colleagues who believed that Catholic religious structures disadvantaged patients. ^ Daly, Mary E. (2006). The Slow Failure Population Decline, An Independent 1920-1963. These findings confirm earlier research by Ó Gráda which established by 1911 many Irish couples, even in rural areas were practicing some form of family planning. ^ "Symphysiotomy in the National Maternity Hospital and Coombe". History Ireland. 2013-03-06. Retrieved 2018-04-16. ^ "SOS Ireland - survivors of symphysiotomy". Survivors of Symphysiotomy ireland. Retrieved 2018-04-16. ^ O'Brien, Carl (Nov 27, 2013). "'I'll never forget the pain. It was excruciating'". The Irish Times. Retrieved 2018-04-16. ^ "Written Answers". Oireachtas Debates. Dáil Éireann. 679. 31 March 2009. Archived from the original on 2014-01-07. Retrieved 2014-01-07. ^ "Symphysiotomy inquiry ruled out". RTÉ. 2010-02-19. Retrieved 2018-04-16. ^ "Harney requests symphysiotomy report". RTÉ. 2010-02-23. Retrieved 2018-04-16. ^ a b "Symphysiotomy: Statements". Dáil Éireann Debate. Oireachtas. 758 (6). 15 March 2012. Archived from the original on 30 Oct 2012. ^ "Symphysiotomy issue gets first Dáil hearing". Irish Examiner. 2012-03-15. Retrieved 2018-04-16. ^ "Woman awarded €450k over symphysiotomy". RTÉ News. Raidió Teilifís Éireann. 23 March 2012. Retrieved 23 March 2012. ^ "Kearney v McQuillan, 2012, IESC" "
^ "Senators debate symphysiotomy report". BBC. 13 Jun 2012. ^ O'Brien, Carl (Jun 12, 2012). "Report shows figures for birth procedure". The Irish Times. Retrieved 2018-04-16. ^ Barry, Aoife (June 27, 2012). "Symphysiotomy survivors "repudiate" Walsh report". TheJournal.ie. Retrieved 2018-04-16. ^ O'Hanlon, Eilis (1 July 2012). "Our godlike 'butchers' must be cut down to size". Independent.ie. Retrieved 2018-04-16. ^ "Symphysiotomy bill passed in Irish parliament". BBC News. 2013-04-17. Retrieved 2018-04-16. ^ O'Carroll, Sinead (26 June 2013). "Symphysiotomy survivors want justice for 'barbaric' acts". TheJournal.ie. Retrieved 2018-04-16. ^ O'Brien, Carl (Nov 26, 2013). "Compensation plan considered for symphysiotomy survivors". The Irish Times. Retrieved 2018-04-16. ^ O'Carroll, Sinead (26 November 2013). "U-turn on statute of limitations as closure sought for symphysiotomy survivors". TheJournal.ie. Retrieved 2018-04-16. ^ O’Doherty, Caroline (2013-12-09). "Symphysiotomy survivors reject offer". Irish Examiner. Retrieved 2018-04-16. ^ Galbraith, John G.; Murphy, Kevin P.; Baker, Joseph F.; Fleming, Pat; Marshall, Nina; Harty, James A. (2014-01-01). "Radiographic findings after pubic symphysiotomy: mean time to follow-up of 41.6 years". The Journal of Bone and Joint Surgery. American Volume. 96 (1): e3. doi:10.2106/JBJS.L.01732. ISSN 1535-1386. PMID 24382731. ^ "Symphysiotomy campaign goes to UN". BBC News. 2014-03-13. Retrieved 2018-04-16. ^ "Symphysiotomy survivors take torture case against State to United Nations". The Irish Times. Retrieved 2018-04-16. ^ "Survivors of Symphysiotomy take campaign to the UN". RTE.ie. 2014-03-11. Retrieved 2018-04-16. ^ Homa Khaleeli (13 Dec 2014). "Symphysiotomy – Ireland's brutal alternative to caesareans". The Guardian. ^ Sinead O'Carroll (24 Jun 2014). "UN tells Ireland to open an investigation into symphysiotomy". TheJournal.ie. This page was last edited on 15 January 2019, at 16:57 (UTC).